AT&T today raised the price of one unlimited smartphone data plan by $5 a month and lowered the price of another by $10, for single-line users. Instead of the entry-level unlimited plan costing $60 and the better plan costing $90, the single-line prices are now $65 and $80 a month (plus monthly taxes and fees and a one-time $30 activation fee for each line). Each of these postpaid plans is getting some enhancements, but they’re not free of limitations. “Unlimited” means that you’ll never get hit with an overage fee or have your data cut off entirely, but speeds can be throttled in some situations, and mobile hotspot usage isn’t allowed on the cheaper tier. The cheaper plan (now called “Unlimited Choice Enhanced”) has been around for a year and originally limited general Internet speeds to 3Mbps and video streaming to 1.5Mbps. That means Unlimited Choice customers will get slower Internet speeds than other AT&T customers any time the network is congested. Previously, they had a 3Mbps limit at all times—now, they can get higher speeds most of the time but could be slowed down to speeds below 3Mbps if they’re in busy areas. The 3Mbps limit for overall Internet usage is still in place for customers on the original version of the Unlimited Choice plan unless they switch to the new $65 version, an AT&T spokesperson told Ars. The $80 unlimited plan (now called “Unlimited Plus Enhanced”) doesn’t have any specific Mbps limit on general Internet use or video. The plan can be slowed down during periods of network congestion, although this happens only after a customer has used at least 22GB in a month. The 22GB threshold also applies to the old version of the Unlimited Choice plan, in addition to that plan’s 3Mbps constant limit. Yes, AT&T’s unlimited plans have many caveats—it’s difficult to keep track of them all. Here’s another one: Unlimited Choice still doesn’t allow any mobile hotspot usage. Unlimited Plus previously allowed 10GB of high-speed hotspot a month and limited tethering speeds to 128kbps after that. Going forward, new Unlimited Plus customers will get 15GB of mobile hotspot usage before the 128kbps limit kicks in. Both plans are now getting $15 monthly “loyalty credits” toward AT&T video services. Buyers of the $80 plan are eligible for a $15 credit on DirecTV, U-Verse TV, or DirecTV Now. Buyers of the $65 plan can get a $15 credit toward DirecTV Now, AT&T’s streaming service, but not the DirecTV satellite or U-Verse wired services. As before, AT&T is giving free HBO to buyers of both unlimited plans, either as an add-on to an existing AT&T pay-TV plan or with a free DirecTV Now account. The advertised prices require signing up for autopay and paperless billing; otherwise, the cost is $10 higher for a single-line plan or $20 higher for multi-line plans. You will have to pay the extra money at first (making the single-line plans $75 or $90 instead of $65 or $80) until the discount kicks in within two billing cycles. As noted earlier, multi-line prices have risen by $5 a month. 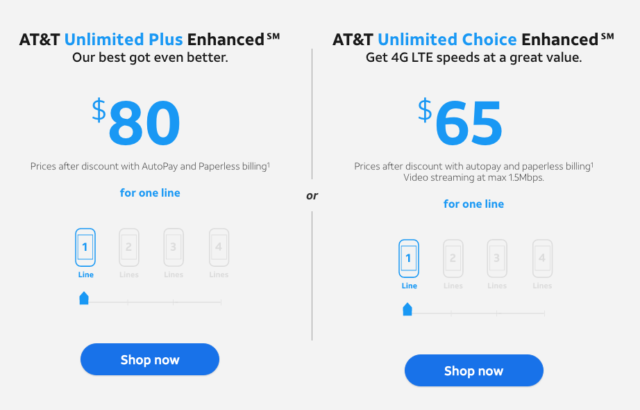 For Unlimited Plus Enhanced, two lines is $150 per month, three lines is $170, and four lines is $190 (after the autopay and paperless billing discounts). Unlimited Choice Enhanced prices are $120 for two lines, $140 for three lines, and $160 for four lines. Additional lines on either plan are another $30 per month. The one-time $30 activation fee for each line is assessed on both single-line and multi-line plans. On a four-line plan, that’s an extra $120 up front.